2017: Is ISIS attack likely in South Africa? Terrorism is about opportunity, and where the Islamic State can gain propaganda value from an attack, it has proven not to hesitate. Add to this a propaganda message to all supporters of using whatever means available to execute an atrocity, and South Africa’s vulnerability to an attack speaks for itself. Compiled by JASMINE OPPERMAN, Director Africa at the Terrorism, Research & Analysis Consortium – TRAC) and JESSIE MARI BROICH, analyst at the TRAC Africa Office. The nature of international terrorism has fundamentally shifted in recent years. While everyone knows about the violent nature of acts of terror, the most concerning risk lies with the “silent nod”, whereby groups recruit members, establish cells, expand their footprint and grow their presence in a country of interest. Add to this individuals acting on own accord, inspired and directed by propaganda calls to action, and the probability of an attack is persistently increasing. Most governments have legislation and counter-terror initiatives aimed at dealing with bombings, mass shootings, hostage taking etc, thus focusing on the violent nature and after-effects of acts of terror. The fact that the group responsible managed to operate silently in the country prior to the attack while recruiting, radicalising and training the individuals accountable, and that these operations went unchallenged, is often overlooked. In short, it is not unreasonable to state that the “silent nod”, given enough time, is just as dangerous as a commissioned act of terror. While conventional thinking tends to focus on reasons why South Africa is not vulnerable to an act of terror, the fact that the Islamic State is already recruiting in the country cannot be ignored. Despite popular opinion, South Africa is not subject to a special set of circumstances that forgo our viability as a target. The Islamic State is all about establishing presence and showing strength, meaning that a terror attack in South Africa would be just as effective as one in Europe. This begs the question: just how much opportunity does the Islamic State have to carry out a terror attack in South Africa? A “lock up and go” mentality when dealing with threats (such as protest action, riots, and potential acts of terror), in which perpetrators are apprehended and jailed and the matter considered “dealt with”, is set to fail as a counterterrorism response. Conversely, while the public tries to keep itself informed and aware, most people employ private security companies (few of which can claim adequate training regarding situations involving terrorism) to secure their safety. In some cases attention is given to the causal relationship between the origin of these threats and the threats themselves, but mostly things are expected to go back to normal once the instigating parties have been removed from the environment. With regards to potential acts of terror, a temporary response to threats is wholly inadequate. As such, South Africa’s current counterterrorism strategy amounts to a culture of “government only response”, with the public needing to fend for themselves through private security companies with little to no training in counterterrorism initiatives. All in all, without the presence of mitigating factors, South Africa remains an easy target. It is time to accept and respond to an undeniable reality: the Islamic State is already operating in South Africa in a non-violent capacity. So the longer the implementation of permanent mitigating factors is ignored, the more likely South Africa is to experience an act of terror in the near future. The answer is to be found in two aspects, limiting the impact of the Islamic State current presence within a non-violent evolutionary reality coupled with a focused strategy in which misguided perceptions against Muslim and foreign communities as well as fear of an attack are challenged. A ring-fenced law and order mindset will not suffice. The need for law and order function remains; however, such an approach transcends conservative approaches of vetting and investigations of specific individuals. The non-violent side to terrorism demands new thinking and application, whereby government officials gain the required skills to monitor and trace social network interactions to and from local soil as well as the skill to assess and understand the use of propaganda as a communication tool and how it is taking effect in South Africa. 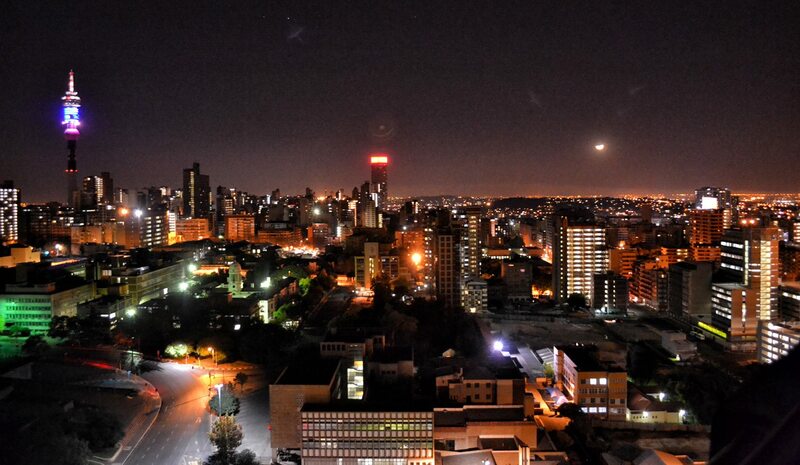 Photo of Johannesburg by Arthur Spring via Flickr.